Hey you, pretty readers of this blog.. I just got back from the shortest vacation ever and I'm pretty much on zombie mode.. need sleep, need a sunny beach, sand in my shoes and a Mai Tai. 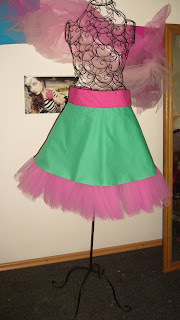 The green-pink skirt pictured in here can only be worn with the right attitude. If you like it and wanna take it home, e-mail us (this one is a size S, but we can make it in any size).